It was the well worth the wait. 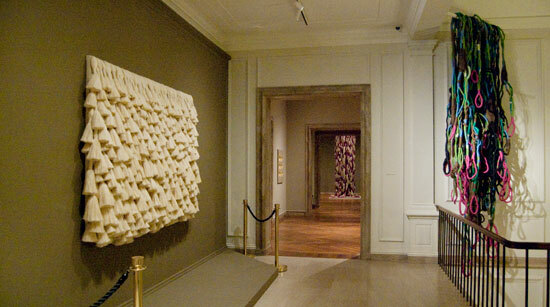 The first museum retrospective of Sheila Hicks‘ remarkable career has opened at the Addison Gallery and will travel to additional venues in the next few years, including the Institute of Contemporary Art of Philadelphia next March 2011 and the Mint Museum of Craft + Design, Charlotte, NC in October 2011. 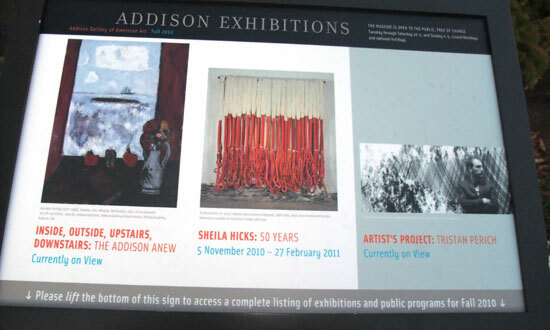 The Addison is an ideal showcase for the expansive exhibition, which includes more than 100 works, journals, videos and photographs. 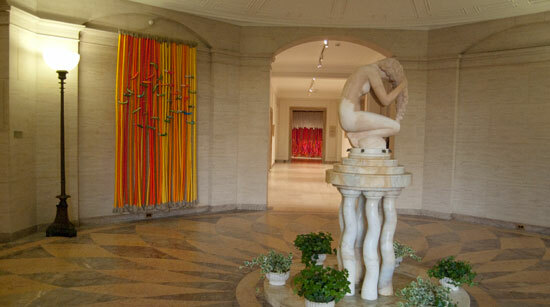 The classic architecture of the gallery provides an ideal counterpoint for Hicks’ brilliantly colored soft sculptures, for the more formal panels of stitched medallions and linen pony tails and for the minimes, framed miniature works, from various decades that are featured throughout the exhibition. When we arrived at sundown, the building was bathed in golden light an inviting complement to La Mémoire, the brilliantly colored series of wrapped cords to the left of the entrance and Bamian, the larger jewel-toned installation that can be seen in the distance in the gallery down the corridor. 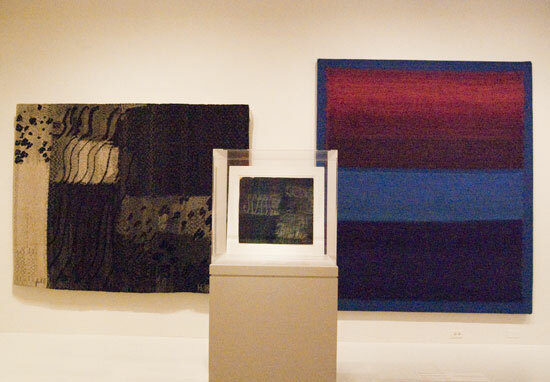 The exhibition is comprehensive, addressing the remarkable reach of Hicks’ artistic life, which has included learning sewing and embroidery as a child in Nebraska, studying painting with Josef Albers at Yale, weaving in South America on a Fulbright and site commissions for public spaces including the Ford Foundation and Georg Jensen in New York, the Target corporate headquarters in Minneapolis, the Fuji City Cultural Center in Japan and the Banco de Mexico headquarters, with architect Ricardo Legorreta. In addition, Hicks has also published a magazine, created designs for commercial production, taught, founded workshops in Mexico, Chile, and South Africa, worked in Morocco and India, pursued interior and exterior architecture, sculpture, photography, book design and writing. To unravel this extraordinary range, the exhibition focuses on five related fields of inquiry: miniature weavings and drawings, site commissions for public spaces, industrially produced textiles and workshop hand-productions, bas reliefs and sculptures, and process works made of recuperated textiles, clothing and other found objects. Regardless of the period, the works in the exhibit are strikingly original. We found ourselves constantly checking dates as 40-year-old works appeared as fresh as those made last year. The conclusion, after viewing Sheila Hicks; 50 Years, is inescapable: Hicks has reinvented textile tradition, and, in the process, transformed the terrain that links art, design and architecture.
. We hope to see it in a least one of the venues that follows. Hicks work has always been about inhabiting space; we’d like to see this exhibition reconfigured. The exquisitely designed and lavishly illustrated accompanying volume from Yale Press, Sheila Hicks: 50 Years, by Joan Simon and Addison Curator, Susan C. Faxon, with an essay by Whitney Chadwick, documents the full extent of Hicks’ work, from exquisite miniature weavings to major sculptural pieces to such large-scale commissions as The Four Seasons of Fuji. It is available from browngrotta.com. 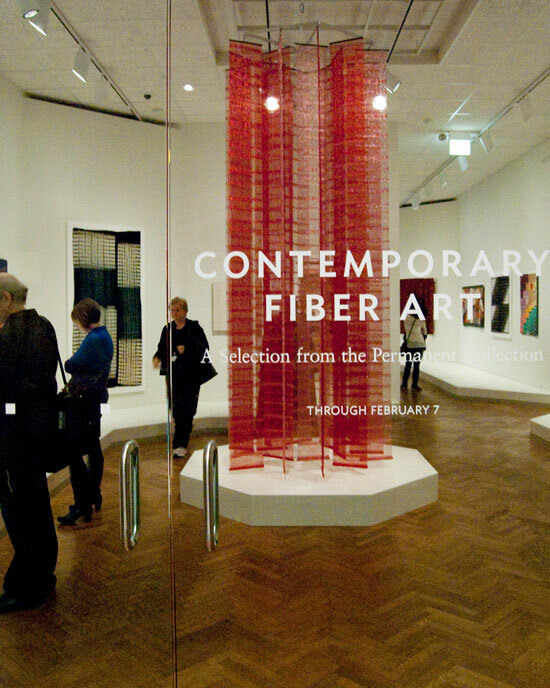 last day of SOFA to see Contemporary Fiber Art: A Selection from the Permanent Collection, the inaugural exhibition in the reopened Elizabeth F. Cheney and Agnes Allerton Textile Galleries, which were closed for five years during the construction of the Modern Wing. 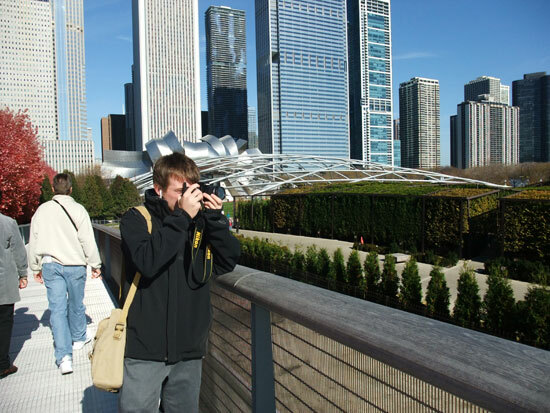 We walked there in the glorious morning sunshine, through a corner of Millennium Park, and entered the Institute from the bridge. Heading down to the textile galleries feels a bit like entering the basement, but once inside, the spaces are light and airy. The holdings of the Department of Textiles at the Art Institute comprise more than 66,000 sample swatches and 14,000 textiles ranging from 300 BC to the present. Extensive holdings of ecclesiastical textiles, 16th- and 17th-century velvets, 18th-century silks, 18th-20th-century printed fabrics, and lace are included in the department’s impressive collection of European textiles. 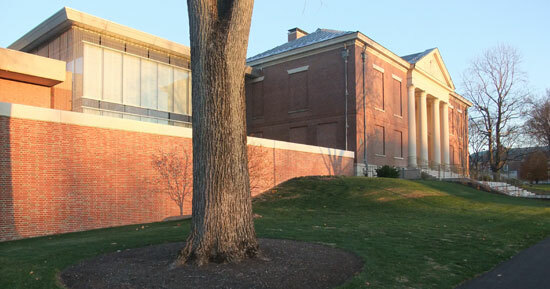 Other notable holdings include American quilts and woven coverlets, historical fashion accessories, dress and furnishing fabrics and Japanese and Chinese holdings. 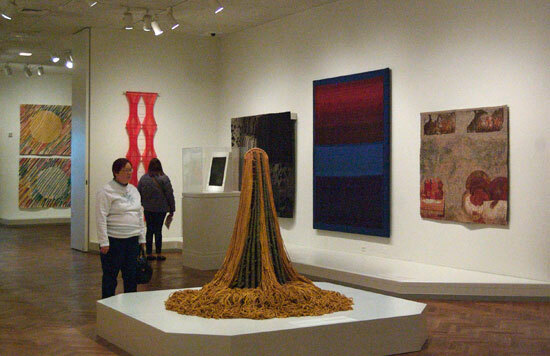 The Collection also includes more than 400 textiles and fiber art works from the 20th Century. These are not freestanding fiber works, sculptures vessels or baskets, for the most part, but wall hangings and ceiling-hung pieces. Sixty-one of these pieces are currently on display. Nonetheless it is an impressive grouping. The usual suspects are here – Lenore Tawney, Sheila Hicks and Claire Zeisler, Peter Collingwood and the Poles, Magdalena Abakanowicz, Zofia Butrymowicz and Jolanta Owidzka. But there are some surprises. Red Doors, by Robert D. Sailors, which graces the entrance is a show stopper. The Cynthia Schira that is included is an excellent piece. Helena (Barynina) Hernmarck’s 1965 abstract tapestry Mu1 is enhanced by the powerful painted maquette that is displayed alongside. The Mariette Rousseau-Vermette work, Si Rothko M’etait Conté (If Rothko Himself Had Told Me a Story)(which we assisted a client in donating) was luminous. We were delighted to see the tapestries floating off the wall, as we recommend, giving added dimension to the works. One quibble, the works in the cases in the conference room, which include a piece by Scott Rothstein, need to be better lit. Maybe motion detection lights would work, which would minimize energy use and uv exposure but still enable the works to be seen when viewers enter the room. The items selected work well together, as curator Christa C. Mayer Thurman, emerita of the Department of Textiles, intended. 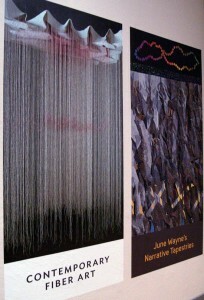 The exhibition’s stated aim — to explore how fiber art has developed as an art form from the middle of the 20th Century through today and illustrate how the flexibility and variability of the medium encouraged artists to explore the potential of different fibers and methods — has certainly been achieved.